A flight, a flight, my “Kingdon” for a Flight. To the chaps who look after the servers and stuff that support the Kayak website I apologise. I fear I have given your infrastructure a bit of a beating this week, not only from the laptop, but also from your excellent iPhone app. I can report that all is functioning correctly, apart from one element. No matter what bizarre combination of dates and departure and arrival airports the resultant figures displayed do not please me. So as you can probably guess, we are still looking for flights. The best we can seem to find are with Thomas Cook, direct to Sanford in August. They come in at £619 each but do mean that we have no seat back TVs and a seat pitch so small that you have to stand up all the way, like one of those standy up rollercoasters! The rotters are charging £419 three days later!! Even if we do end up in Florida, the deal is that we do not do the Disney theme parks. Universal is on the cards, with a stay at the Hard Rock, but our Disney fix would be limited to Downtown Disney, and a look around a couple of resorts. I am Ok with this, as we don’t need to do the WDW parks again, after eleven years on the trot, and a bit more relaxing would be a nice change as long as the girls can cope with the inertia. In theory this shouldn’t be an issue, as when they are at home it takes a small incendiary device to get them to do anything at all. If we do a villa, with the internet, a pool and a TV then they can amuse themselves much as they do at home. Crucially, unlike at home, I won’t have to drag my sagging body out of bed at silly times, sit in traffic and drizzle for an hour to then sit in an office I don’t want to be in, doing things I don’t want to do. WDW Resorts – Always a favourite past time of mine, and even the girls can put up with it, as it will probably involve “cute American boys”. Eating – As you may know from my trip reports, we are pretty good at this, and in fact our days have often been constructed around our plans for food! Should keep us from getting too bored, and with a few days at Universal with FOTL privileges, and then some time on a beach, it sounds like I have given this plan some thought!! As if. By the way, for the coast bit, I may be in the market for some DVC points for a bit of Vero action should anyone have any going spare? Still, until someone is willing to carry us across the Atlantic for something less than the ridiculous sums being quoted, all this expert planning is for naught. Away from holiday planning, the week has been fairly normal. Thankfully, it has been without medical emergency. It has been half term up here, and Louise took the chance to take Emily to look for her prom dress. One was found, and I was despatched on Saturday to pick it up. I shall refrain from any photos at this point, but fear not, at the time she actually wears it, I shall bombard you with proud Dad photos! I haven’t yet told Rebecca that due to the cost of the dress she’ll have to wear it too, and if at all possible both may get married in the bugger too! Saturday evening saw us out together as a family. This took some organising. I had to book the girls well in advance, and it was nice to do the family thing. We went to the local cinema and watched Paul. Having not been to the cinema for a while, I made the most of it with both a three scoop Ben and Jerrys, and soupcon of Pick n Mix. Of course I felt sick, but as they say, no pain no gain. I can recommend Chunky Monkey, Phish Food and Cookie Dough as a combo made in heaven. With Louise’s famous New York Cheesecake in preparation for tea, I fear my meager efforts at exercise this weekend may be in vain! We (well, Louise) has purchased a rowing machine, and I expended more sweat erecting the thing than actually using it, and I suppose there is a common issue for men of my age! All the effort in getting it up, meant that the time actually “in action” was brief. Enough? OK.
Back to the film. Paul is great. I have liked pretty much everything Simon Pegg has done, and I wasn’t disappointed at all. It is funny and entertaining, and if you can forgive the language (the girls hear worse during my DIY sessions), it is fun for all the family, unless your kids are toddlers!! I have to go now, as preparation of the Sunday roast is down to me today. I have to say these Sunday roasts are not my favourite. The enormous effort involved in actually cooking stuff properly never lives up to the minutes it takes to eat them. In fact I may nip down to the cinema and get my triple scoop combo instead, and follow that with some cheesecake! Let me finish with a plug. I was very flattered to be asked to contribute to a new web site called www.nottheface.co.uk this week. So I did, and my first “effort” is now up there, so please click along and have a read….not my bit necessarily, as there is much goodness there, but if you don’t read mine I will hold it against you!! If you all comment on mine too, it will make me look urbane, insightful and popular all at the same time. It won’t surprise you in terms of content and style I’m sure!! Right, let’s be having these roasties and veg then…. Fly my pretties. Not at those prices!!! It is a constant inconvenience that I live on the wrong continent. Yep, you guessed it, the annual addiction has kicked in, and both Louise and I have reached the “Goddam it, we need a holiday” point simultaneously. 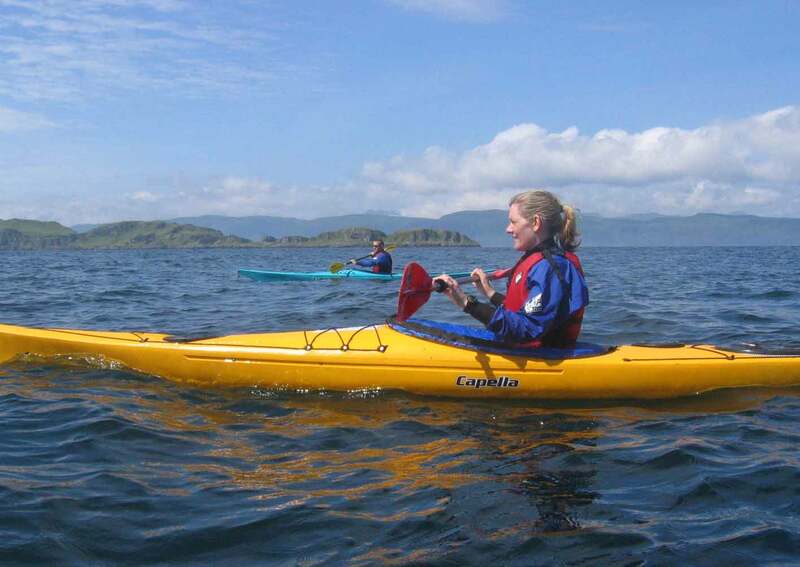 I have therefore spent my week using a Kayak, and I don’t mean one of these. It is therefore a thorn in our collective sides that there is a huge piece of water between us and our desired destination. Well I say our…I may have conceded that another trip to Disney is not on the cards, but my continent of choice is still North America. When asked why, I can only shrug my shoulders, reference the TV programmes Benidorm, and Shameless, and explain that if I wished to live in either, I am close enough to the dodgier parts of Manchester to do so. This chunk of water is a right pain, as it takes an even bigger chunk of cash to sling shot our collective frames across it, and this, at this point seems to be a blocker. The complete lack of any budget at all is also a slight blocker, but still it doesn’t hurt to look does it? Well, I’ll tell you it bloody does hurt, as it rubs your untanned nose in it, that you have no chance of getting to your desired destination unless you either take the kids out of school (let’s not have a debate!) or simply leave them at home. Should we be able to overcome the budgetary crisis and aviate ourselves to the US, our tentative, yet futile plans are quite loose. We are considering either a West Coast trip, or a return to Florida, but bypassing the routine of theme parks for a jaunt further south, to the beaches of the East Cost, and maybe the Keys. Anyhow, I may as well be planning a quick trip around the moon. Both are equally likely. In terms of the flight prices we are seeing, well the average is around £750, which when you times it by four is just north of way too much for us. I don’t know why I do it to myself, but if I nudge our dates out by a day or two, until just after the girls have to be back at school, the prices fall mockingly into our “that’s reasonable” bracket. Education is over rated I think, however, at the ages they are, there is no longer the option to take them out of school. Emily will be starting sixth form next September (Yes, I know, incredible!) and Rebecca Year 10. Back when they were at Infant and Junior School I think we did take them out for a day or two, and they managed to catch up with the colouring in OK.
Louise is less precious about the destination, and just wants some sun and relaxing. I’m up for that, but I fear we have created a monster with the girl’s expectations of a holiday, and after about four days “sun bathing” they may be climbing the walls, and be on the verge of mass murder for an internet connection. A quick look at other cheaper, non US options shows that a private villa in somewhere like Spain would be do-able, but I think even Louise would admit that this is a definite Plan B, and one we shall keep as that until all other avenues are exhausted. Another Saturday night has passed without the correct sequence of balls (this is merely a lottery reference!! ), and so we trundle on, battering the internet, hoping that some combination of inputs may make the page throw up some numbers that start with an acceptable figure. Perhaps if we fly into Alaska and drive down?? Believe me, I have looked at flight options similar to that. Am I hopeful that we shall find what we need? Not really. I fear the flights will price us out of a trip this time around, and as much I will absolutely grumble, I shouldn’t. We’ve had a good run, and a year off would not be reason enough to herrumph through the year, spitefully cursing the financial crisis, rising fuel costs, and my lack of lottery win. 201 people can't be wrong!! Finally, in other better news, I passed a Twitter milestone this weekend, and hit 200 followers. I appreciate this is not Stephen Fry like, but I am pleased nonetheless. If you follow me, thank you, and if you don’t, that’s probably wise, as the next few weeks may be full of flight price induced rage. So if anyone spots a flight from Manchester to anywhere vaguely American, sometime in late August, that starts with something less than a six, give me a shout?? What a bobbins week on the work front. I won’t bore you with the un-pleasantries, but it has been full of busy, late nights, frustration and missed deadlines. So after opening with the customary moan, let us move on to better things. A few weeks ago, I somehow got wind of something called a Taste Card. I think it was from the Martin Lewis email, but I can’t remember to be honest. Anywho, there was a three-month free trial, and it entitled the holder to half price food in lots of restaurants. Those of you who know me, even in the slightest, would know that this combo would be a winner with me, so I signed up. The card came last week, and it was timed quite nicely as with Valentine’s approaching, on Saturday we wanted to go out for a meal. Not wanting to break the romantic mood by seeming cheap…er than usual, I mentioned the Taste Card concept to Louise with trepidation. Louise believes that if you pay the maximum amount possible for something, it guarantees it to be the best it can possibly be. So me saying I can get us half price food for our Valentine’s jaunt was a risky strategy. Still, as all our wealth for the next twenty years is sunk into our new bedroom, it was recognised that any saving would be welcome, and I began to scour the Taste Card website and iPhone app to see which restaurants we could go to. A lot of them don’t “do” the scheme on a Saturday so our choices were a little limited, and we ended up choosing, well I did, a place in Haslingden. 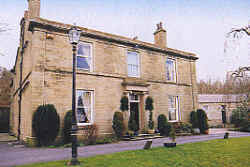 This is about half an hour from us, and The Ridings restaurant was situated in the Sykeside Country House Hotel, which all sounded very promising. With a table booked for 7.30, Louise started to get ready just that five minutes too late to avoid me pacing the hall looking at my watch getting stressed, as my aversion to being late kicked in. Leaving a house full of teenagers behind us we set off through the likes of Ramsbottom and Stubbins, which are not unlike the lands in Lord of the Rings really, and amazingly, no doubt due to my impressive Mondeo manoeuvres, we arrived in the car park at 7.30 on the nail. The car park looked fairly empty, and at this point I was a little worried I must admit. The place itself is a stunning old mill owner’s house, with lovely old decor, and impressively, once was home to William Roache from Corrie! I don’t think he owned the mill though. 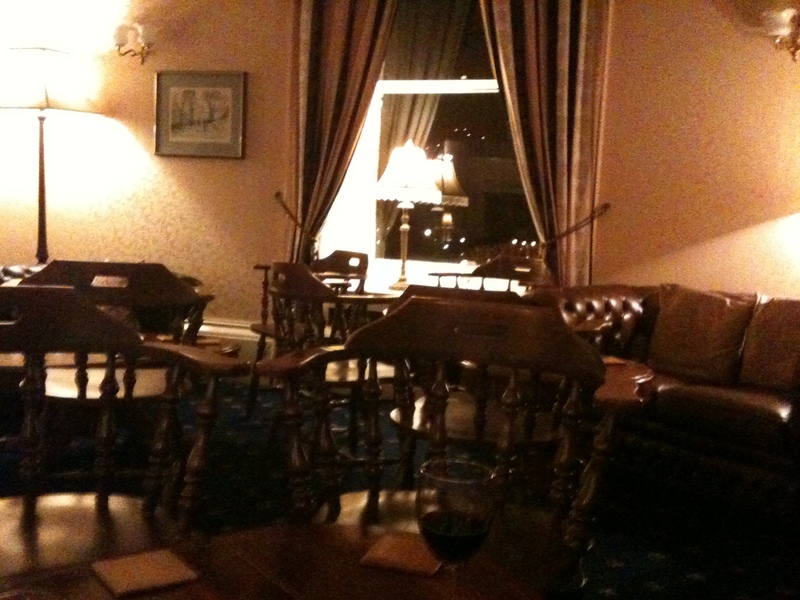 We are welcomed into the bar, and we order a drink and take a seat in a comfy couch near the fire. As we look over the menus we are presented with some horses douvres by an amazingly polite young waitress. So far so good. We are soon ushered through to our table, and the real fun begins. The food arrives. Wow! To start I ordered the Gateaux of black pudding served with crushed potatoes and leeks, drizzled with a light grain mustard sauce. The German for gateaux is kirschtorte!! I know it looks like a dessert but I think this is the idea, hence the name. 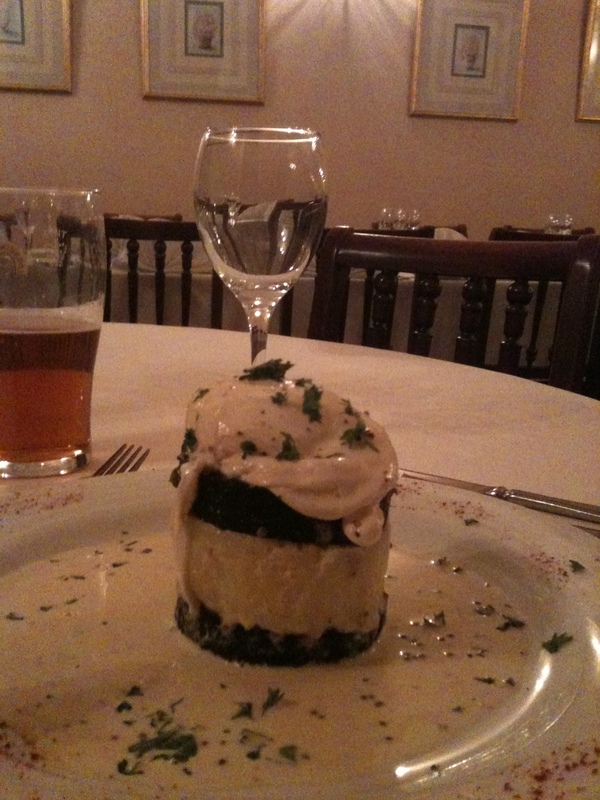 It is black pudding top and bottom, with mash in the middle, topped off with a poached egg done to perfection. The mustard sauce is just superb too. Silence descended as we tucked in. Louise? Oh, yes she ate too. 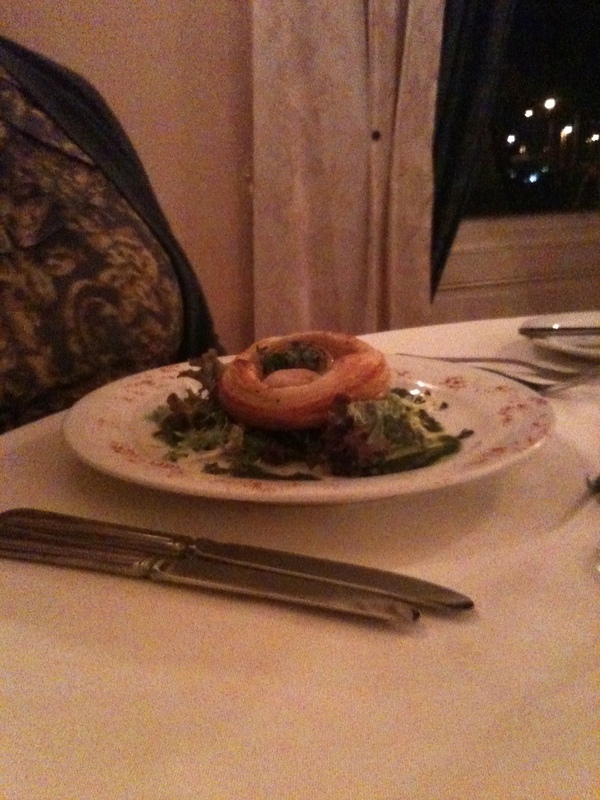 She ordered the Mushroom and Gruyere Tartlette. This too was declared wonderful. At this point I’m just relieved that my choice looks to be going OK.
Me – A chicken breast served on a black pudding potato cake. Louise – Some deep-fried goat’s cheese thing. This was served with lovely veg, including some deep-fried cauliflower. Marvellous. 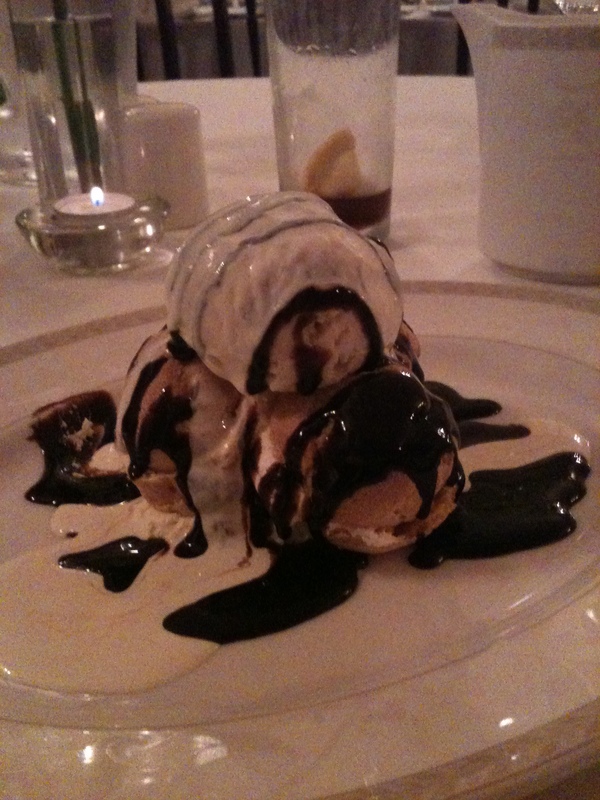 Just to make sure two courses were not a fluke I volunteered to test out the desserts, and went for the profiteroles. Just wonderful, so no, the first two courses were not a fluke. Add to all this lovely food, the fantastic service and we had a great time. So much so that as we retired to the bar for another drink, I felt almost guilty using the Taste Card as what we had just eaten was worth every penny at full price. However, with the Taste Card discount, all of that cost us £38, including three glasses of wine, a beer and a diet coke!! We rolled home very satisfied, vowing to return very soon. So apologies for the food review style of this week’s post, but we were blown away with the place, and for those local enough to try it, you must! For those not local, then the least you should do is get to the Taste Card website and sign up the free trial, if it is still on, or just get one. We haven’t eaten much today to be honest, mainly as we had a long lie in, and since then we’ve been busy, me finishing off the wooden floor with my Dad. Well, to be honest I was handing him stuff whilst he did it, and Louise has been doing the big shop, and is now ironing. Rebecca has been busy though, and our reward for yet another weekend with a house like a youth hostel is a cheesecake made by her own fair hand for after tea. She is also as I type chopping stuff for our Shepherd’s Pie. Poor Shepherd! I look forward to a better week at work, and a very yummy tea!! Louise needs an early night I think as she looks a little peaky to me. Flat Pack, you are the devil’s spawn. Nobody asked me that question this morning. Either they follow me on Twitter (and you should! ), or they could tell from my smacked arse face, and exhausted haunted look that the answer was likely to be in the negative. OK, so in the grand scheme of things, as ever, things aren’t so bad, but my finely tuned sense of persecution is currently in overdrive, with every phone call, conversation or activity seemingly being a new problem to deal with. So the weekend just gone was not restful or relaxing to be honest. However it was preceded by more worrying issues with another trip to hospital for Louise on Thursday. She had a very bad night on Wednesday, with lots of pain and not much sleep. With Thursday being her day off, she took herself off to the emergency doctor, who quickly referred her to hospital. So, via text, I was getting updates from Louise during the morning, whilst enjoying a meeting at work, telling me that she was off to hospital. I joined her there in the early afternoon, and we (well she) went through the usual procession of elimination techniques that we are very familiar with now. Bloods and wee tested, x-rays done, and still nobody is any the wiser. A consultant turns up, and orders a CT scan for the following day. So Louise spends another night in hospital, and my biggest challenge is ensuring the girls have clean socks for the following day at school!! A challenge to which I rose impressively. Friday passes, a CT scan reveals nothing, and Louise is sent home at tea time, pain gone, but still totally in the dark as to what is going on. Groundhog day. A full day of flat pack assembly on Sunday, and this was just for two quite simple bedside cabinets. Handy Andy I ain’t. I am happy to accept that the length of time needed to complete this was down to my incompetence, but the fact that my Dad helped, and it still took ages, tells me that the instructions were bobbins. My Dad has worked in the building/roofing trade for forty years! The utterance of every swear word known to man, and a few new ones too, on Saturday evening, when we discovered a new water feature in the kitchen. The silly amounts of rain were obviously too much for our kitchen roof, and therefore a fair amount of that rain found itself onto our kitchen floor, via our light fitting. This was a particular low ebb, I must say. I sulked quite a bit about this it has to be said. I thank Louise for her patience in this regard, and for not tripping over my bottom lip. My Dad’s involvement in the roofing trade means that we had a man on our roof today (it’s who you know! ), and I am only a little bit scared to find out what the damage is, both structurally and financially. As is often the case, anyone enquiring if we have booked our next holiday yet, may be met with a complete sense of humour failure at the moment. We are some way of simply being skint, and indeed, I aspire to just being a little short of cash, I dream of being a little tight of the green stuff. You get the idea? We are going nowhere! Still, on the plus side, I love our new bedroom, I could spend a full day in our new shower (stop those rude thoughts! ), and whilst I have plastic in my wallet, we will have food on the table! Add to all of that, the fact I can now enjoy and even discuss football, thanks to the return of the King to Liverpool, as I said right up top, in the grand scheme of things, it could all be a lot worse. Repeat until it sounds convincing! This is no way alters the fact that I shall still no doubt sulk, swear and bemoan every new problem and crisis in my usual grisly manner. I defend my right to do so. Full of repressed anger and resentment at our leaky roof, we retreated to bed on Saturday night with Clive Owen. 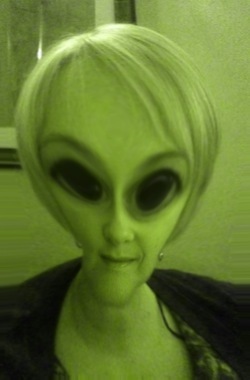 I am quite open-minded about the whole thing really, and don’t feel threatened at all. Anyway, he can’t be all that as Louise was asleep within five minutes, leaving me and Clive to it! 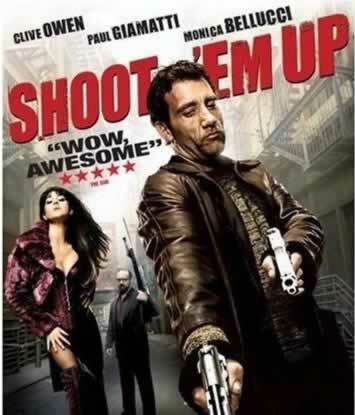 I of course refer to Shoot Em Up, the “classic” action flick starring Clive. Can you really be a film star when you are called Clive? We seem to be on a roll where films are concerned at the moment, and not a good one at that. My benchmark for a film being far-fetched is, and I thought always would be Con Air…I have told you this before. Well, I may have a new standard by which to judge. This was a cracker, in all the wrong ways. My favourite part of the film was when Clive dived from a rooftop, through a window into an apartment, escaping some baddies. Doesn’t sound so far-fetched does it? Well, if you add in the fact that he had a new-born baby tucked under one arm, this, in the first ten minutes of the film, set the tone of what was to follow. Later, as he drives towards a truck load of baddies, he shoots out his windscreen, undoes his seatbelt, so that upon impact he is thrown through the front window, through the truck’s front window, forward rolls in midair and lands in the back of the truck, and is thus able to shoot all six or seven baddies before they realise what has happened. He did not have the baby under his arm at that point though. This standard is relentless all the way through the film, and can only be believed by witnessing it for yourself. Go on, I dare you. So hopefully, financial ruin aside, things can only get better from here on in, and I look forward to a better week ahead. I know I have to go to work, but apart from that!! For DIY induced swearing fans, you can look forward to the delivery of our new wardrobe in a week or two, for the full extent of vocabulary to be tested. If the bedside cabinets are anything to go by, this could be a good one. They have mirrors for doors, and spotlights and everything. It could all get very nasty. For fans of overweight balding forty year olds, you only have until Thursday to sneak a peek of my impressive frame through our bedroom window, as our custom (translates to expensive) blinds are to be installed. The crowds outside are becoming a minor pest to the neighbours, so that is a relief all round. I am going to wander off now, to look after the chip on my shoulder, and have a tantrum. I feel it is deserved.